Slightly Stoopid, the Ocean Beach, California based group led by co-founders and multi-instrumentalists Kyle McDonald and Miles Doughty, along with drummer Ryan “Rymo” Moran; percussionist Oguer “OG” Ocon; saxophonist Daniel “Dela” Delacruz; keyboardist Paul Wolstencroft; trumpet and trombone player Andy Geib; plus special guest and “unofficial 8th member” Karl Denson (The Rolling Stones/Greyboy Allstars) on saxophone unveiled their latest musical experiment Meanwhile… Back at the Lab through the band’s own Stoopid Records on June 30th. The sessions for Meanwhile… Back at the Lab began in late 2013, shortly following the band’s seventh studio release Top Of The World. The forthcoming album was recorded at the band’s studio, as well as at Platinum Sound, NYC; Rivas Studios, L.A.; Mixdown Town LBC, Long Beach, CA; and was self-produced by the band along with The Lab’s in-house audio engineering maestro James Wisner with the help of Jerry Wonda (The Fugees, Wyclef Jean) engineered an impromptu late night/early morning session at Platinum Sound, yielding the collaborative “Come Around.” Back home, Kyle and Miles also called on their long-time friends and Southern California music icons, Michael “Miguel” Happoldt and Marshall “Ras MG” Goodman, to produce standout tracks “Life Rolls On” and “The Prophet.” "We're a touring act, and we've been on the road pretty much non-stop over the last decade," explains Doughty, offering that the band's own local recording studio and rehearsal clubhouse “The Lab at Stoopid Studios” (within the warehouse district of Mission Valley just inland of Ocean Beach), is a key ingredient of what keeps the band’s sound fresh. In fact, the title and album cover reference the band’s collective escape from touring where they have been working on numerous creative and collaborative projects. "Over the last several years we started our own studio and invested into innovations and equipment, upgrades in a quest to capture and progress our ideal signature sound. Having our own studio really enables us to make records at our own pace and to make the right records, hopefully (with a grin) at various stages of our career,” Doughty continues. “What's nice about having our own environment to record in, and analyze the music, is it really lets us keep an organic feel. For Slightly Stoopid, I feel like it's a step into the next level, as far as understanding the process of recording, understanding the process of songwriting. We took everything that we've learned over the years and really put it into this place and into our music.” The property also houses the creative loft space that has become the official offices Stoopid Records, which issued the band’s third album in 2000, Acoustic Roots, and has continued to be their preferred method of distributing the band’s recorded material. "We started Stoopid Records around 1999,” Doughty clarifies. “At that time, we were in transition as far as what we were doing with our records, and we thought it would be good to have our own independent label—like Sublime showed us back in the day with Skunk Records. What's nice is we've had a following with the fans, where people understand that Stoopid Records is Slightly Stoopid, as well as other bands we want to help break out." "For us, it was a big turning point as far as having complete creative control over everything we do. That's something big for this band—we want to make the music for ourselves and for our fans. We don't really make music for someone in an office that tells us something needs to be there. We've always had a very organic, do-it-yourself attitude. I think it's paid off in dividends." 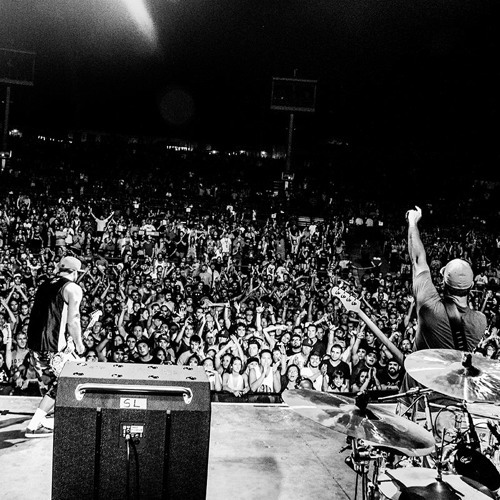 Nearly two decades into their artistry, Slightly Stoopid continues to progress into new musical territory, defining their signature sound while creating a contagious feel-good vibe that has its own lifestyle and subculture… and it’s been done entirely on their own terms.